NEW YORK—Every choice a person makes is a test of his or her mettle. Yet when a choice becomes a matter of life and death for many, the question becomes how far should one go for the sake of the greater good. 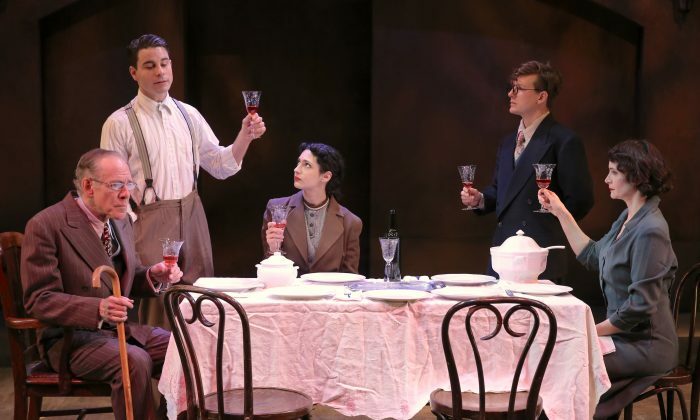 Ira Fuchs’s powerful drama “Vilna,” now having its world premiere at the Theatre at St. Clement’s, spans from 1928 through World War II and is a work that should be mandatory viewing for everyone over 18. According to the program notes, 49 percent of millennials cannot name a single camp or ghetto from the Holocaust. Yet, at the same time, Vilna was also a well-regarded cultural metropolis with theaters, concert halls, hospitals, and universities. 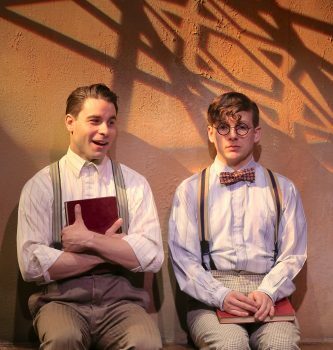 Among those living in the city are Motke Zeidel (Sean Hudock) and Yudi Farber (Seamus Mulcahy). Born to Jewish parents, Motke is a bit of a dreamer, with no desire to follow in the footsteps of either his physician mother or glove-maker father. Yudi is an orphan of German-Jewish parentage, with a great head for figures. He wants to become an engineer. Meeting as boys, the two quickly become best friends, so much so that Motke’s parents eventually take Yudi into their family. This situation works out in their favor years later. To get around a new law designed to force Jews out of business, Motke’s father, Josef (Mark Jacoby), transfers control of his glove company to Yudi who, because his father was German, is looked upon as such by the authorities. The rise of anti-Semitism is responsible for setting Motke on his own path. He becomes a lawyer so he can fight for his people in the courts. However, with the increasing influence of nationalistic groups and the ever-growing threat of war, the only way Motke and the others can remain free is to perform needed services for whichever invader comes calling. His and Yudi’s respected status in the Jewish community make them natural choices to act as liaisons between different parties. It’s a fine line that many are forced to walk. With the creation of a ghetto to house Vilna’s Jewish population, there is even less wiggle room. Motke and Yudi are among those tasked with going through lists of people and deciding who will be sent to the nearby labor camps. In return, they are able to keep the ghetto functioning as its own inner city and make sure its health and sanitary conditions are maintained. They thus can save the greatest possible number of lives. Yet the question remains: Is it simply enough to survive a horrific experience, or is it more important how it is done? This question comes up time and time again as Motke, Yudi, and others try to follow their own consciences, while balancing the need for survival with that of resistance. For example, food is denied to those in the ghetto who don’t follow necessary sanitary regulations, such as bathing and shaving. There’s also a reference to illegal immigrants and what their presence means for the rest of the ghetto’s population. As the play shows, it’s easy to scream “No! !” when you’re not the one having to make decisions for an entire community, or when your actions—no matter which way you choose—will lead to people’s deaths. For all the play’s seriousness—most of the characters depicted actually existed—”Vilna” is a work filled with ironies. In an early scene, Motke’s mother (Carey Van Driest) is berated by a Polish customs officer (Patrick Toon), only to have him later ask her in all seriousness for medical advice. Hudock and Mulcahy are excellent as Motke and Yudi, each of whom makes his own stand in an unspeakable situation. Jacoby adds a nice touch of old-world gravitas as Josef, and Driest is good as Motke’s no-nonsense mother. Tom Morin presents quite a poignant turn as Pietr. First seen as a young, uneducated boy, he goes from helpless victim to conqueror and back again. Paul Cooper gives the most chilling performance by far as a German officer determined to carry out his orders regarding the Jews. Sophia Blum is good as Chayele, a singer and potential love interest, offering a bit of joy in the face of an oncoming storm. Joseph Discher’s direction is strong. He and Fuchs slowly and methodically introduce the audience to the various characters and ratchet up the tension as the story progresses. While the early part of the play is perhaps a bit too by the numbers, that feeling vanishes as the tale unfolds. Sets by Brittany Vasta, which often depend more on the imagination than anything else, are fine. Lighting by Harry Feiner—alternatively harsh and subdued—also helps to strike the right tone. As time passes and these powerful events recede into history, they all too often run the risk of being forgotten. “Vilna” reminds audiences in no uncertain terms why these stories should continue to be told. Please note, the theater is not wheelchair accessible.